At $1,105 for the standard 18-55mm kit, the EOS M has a slighty more expensive price than that of the user-orientated Sony NEX-5R with similar specifications, while it’s about $316 more than the very powerful Panasonic GF5. However, the really interesting thing is that the EOS M is more expensive than the EOS 650D, a camera with which it shares lots of its technologies, such as the sensor. Choosing the EOS M or its DSLR sibling will be determined by how you want to shoot images. Choosing the EOS M or its DSLR sibling will be determined by how you want to shoot images. Combining the best parts of its compact and DSLR seires, Canon has offered one of the most powerful and easy-to-use CSCs today. While there are some things that disappear on the EOS M, on the general view it’s a very well specified camera, with lots of things to make both inexperienced and more experienced users satisfied. To support this, the EOS M’s big APS-C sized CMOS sensor provides some of the best results for a camera of this class and it can compete with many other DSLRs. All is put in a nice, well-made and simple body, with the magnesium alloy panels giving a firm feel that can defeat some of the more expensive models. However, what really makes the EOS M outstanding is the touchscreen interface. While the Sony NEX-5R’s interface might be bulky to use and the Panasonic Lumix GF5’s interface can’t hold the same level of control, the EOS M’s interface is both fast and easy to use. There’s still a need for improvement. The important thing is to make further additions to the EF-M lens series, while the AF speed and burst shooting can be much faster. For those who are looking to upgrade from a compact, this is a perfect CSC option, while DSLR owners looking for a lightweight alternative shouldn’t underestimate it because once you have leave out the lack of body-mounted controls, you will find a camera which is both fast and easy to use. With all other big opponents who are establishing their place in the CSC market, Canon needs to provide something, and with the EOS M, it has done a great job. Packed with smart features and a fast AF system, but the small 1-inch sensor can’t beat the EOS M’s one. A great CSC for upgrading users, easy to use and well made, but its images can’t beat the EOS M’s ones. With an APS-C sized sensor to rival images from the EOS M, it has a clumsy user interface. · Touchscreen interface is one of the best we have ever seen. 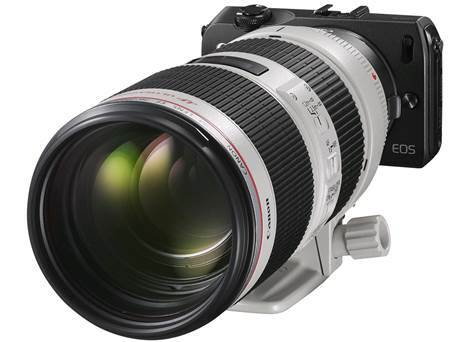 · Image quality can compete with some DSLRs, providing excellent results. · Magnesium alloy panels provide a high-ranking surface.